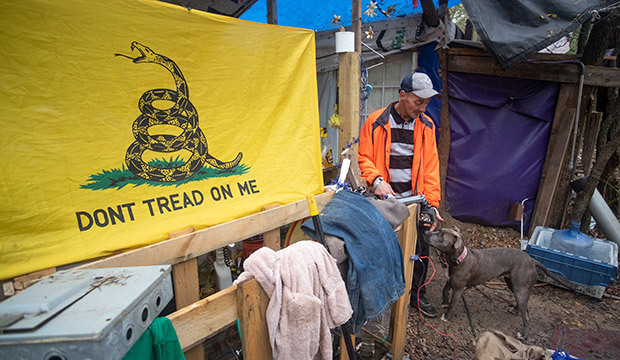 Billy pets his dog "Scrappy" as they stay in camp in southeast Fort Worth, Wednesday, November 7, 2018. (NTC/Rodger Mallison) See more photos here. Fast forward 2,000 years to a different problem that seems equally insurmountable. About 3,000 individuals experience homelessness on an average night in the Diocese of Fort Worth. But hundreds of Catholic “lads” are stepping forward to offer what they have: homemade brisket. Sewing skills. A listening ear. By sharing their blessings, these parishioners ease the difficulties of life for those without permanent shelter. But in God’s economy, those who give often receive much more. It’s 4:30 p.m. on a Monday afternoon, and more than 40 people have lined up outside the annex of St. Patrick Cathedral for Christ Before Us, the homeless outreach service that the parish initiated almost three years ago. Before the doors open at 5, the line doubles in size as individuals and small groups amble to the downtown building. Some push strollers or carts, others carry a backpack or have a dog in tow. Inside, volunteers are bustling — preparing snacks, assembling hygiene kits, and organizing donations of clothing and blankets. For two hours, their guests will receive shelter, supplies, and solace. Mark Smith, a U.S. Army veteran, was a guest at the annex in its early days. Now, he’s a volunteer, riding his bicycle from Arlington to greet guests at the front door. The lanky Desert Storm soldier has converted to Catholicism and joined the parish and the Knights of Columbus. After Yzaguirre’s first volunteer session doing general service at Christ Before Us, the wheels started spinning in her mind. The 20-year St. Patrick parishioner asked herself, “Can I do more? What talent can I give?” Her ability to mend backpacks, jackets, pants, and shirts is in high demand during her twice-monthly visits. In addition to mending, Christ Before Us offers haircuts and health screenings on certain Mondays. 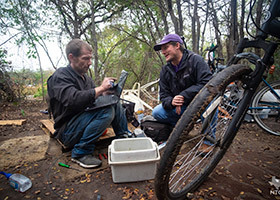 The homeless outreach goes beyond physical needs, too. Guests may check out books from a small library. Coloring sheets provide a means for creative expression. A few join a volunteer in a small room to pray the Rosary. But the biggest human need is often human interaction. Aaron Aguilar, the volunteer coordinator of Christ Before Us, encourages the roughly 60 volunteers to “come sit down, engage, respond, and listen” to the guests, some of whom visit regularly, for three months or longer. “We’re not just a food line, a soup kitchen. There’s some true caring in the interaction,” he explained. Three years ago, the church bulletin notified parishioner Karen Simpson about the initial Christ Before Us planning meeting. She attended with some trepidation. Interacting with homeless individuals was “way out of my comfort zone, but now I look forward to it,” she admitted, as she gave guests the bags to hold hygiene items they selected. Aguilar said St. Patrick Cathedral generously supports Christ Before Us with parishioners’ time and with donations of snacks, hygiene items, and other material goods. One parishioner, whose schedule wouldn’t allow her to attend on Monday nights, has made about 70 quilts from old blue jeans backed with a fleece throw blanket. “Her mother taught her to sew, and this honors the skill she learned from her mother and enables her to give,” explained Aguilar, who said he has seen homeless men sleeping under those quilts in recessed doorways on the streets of downtown. Christ Before Us is a collaboration between St. Patrick Cathedral and Catholic Charities Fort Worth Street Outreach Services (SOS). 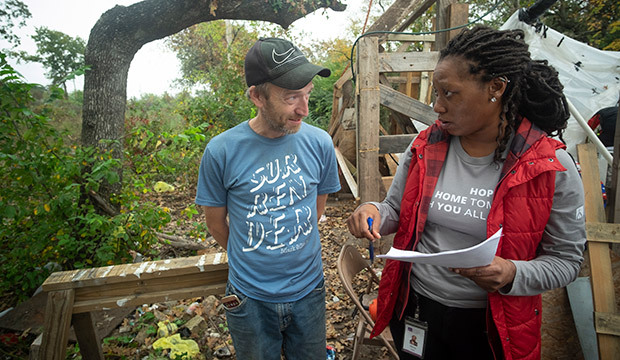 An important purpose of the open annex each Monday is to provide a reliable downtown location for individuals living on the street to meet with a member of the SOS team, who has expertise in case management, advocacy, and community resources. The SOS team bridges the chasm between the sheltered and unsheltered worlds. 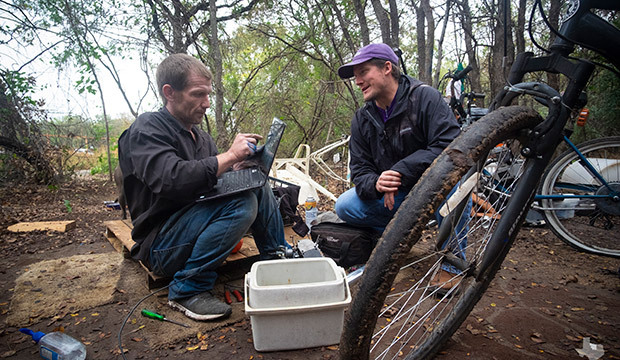 Their normal day in the office is anything but, as they enter into the homes of their clients: under highways, in remote campsites, and other locations frequented by the homeless. Ebony Tatum, one of the five-member SOS team, explained her business plan. “I meet the person where they are at, follow where they are going, and stay with them where they are at.” When she has successfully placed a client in housing, she continues to help them adapt to the routines of apartment living, like paying bills and cleaning. 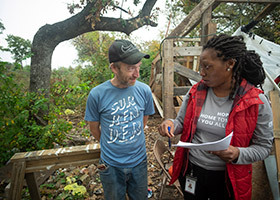 The first step towards permanent shelter often involves tracking down documents so the homeless can obtain a valid identification card — a must for acquiring housing or a job. “Without an ID, without a cell phone, you are nothing,” summarized Davin, a guest at Christ Before Us. Everything, including his glasses, was stolen from him as he slept under a tree in a Wal-Mart parking lot. On a cool morning in November, Tatum and her colleague Nathan Crites-Herren check on Nandora under an overpass in Kennedale. She is almost giddy with excitement. First, a Boy Scout troop recently provided a new tent for her and her husband. Then, Ebony confirmed that they are near the top of the list for available apartments because Nandora served in the Air Force. Like many of the homeless, Nandora has established a community. Her role? The mother hen. She urged a newbie to talk with Crites-Herren and reminded Tatum to check on some neighboring campers a hundred yards north. In the woods off Mansfield Highway, another community is more permanent. 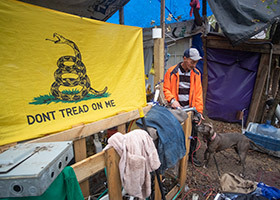 Tatum and Crites-Herren approached the shelters made from scrap wood, tarps, and storage containers, asking permission to draw near. A fire of trash burns to repel mosquitos and provide a bit of heat. Why don’t these people seek refuge at a homeless shelter? The reasons are varied. Cramped conditions; concerns about contagious illnesses; fear their possessions will be stolen; aversion to standing in line hours before the doors open; separation from their partner or dog. Two men mentioned they earn a little cash by cleaning up parking lots after the restaurants close, which the shelter’s restrictive hours wouldn’t accommodate. Before a church provides shelter for homeless individuals the first time, coordinators often spend months considering the logistics of transporting, feeding, and housing. At Immaculate Conception Parish it took one day. On a cold December night in Denton, Immaculate Conception parishioners Betty Kay and Sara Carey asked Monsignor Charles King if he would open the church for the homeless on a night when snow and ice was forecast. Since that 2009 night, their ministry has grown into the Monsignor King Outreach Center, a freestanding center that can accommodate 91 men, women, and children. Operated collaboratively by several churches, organizations, and businesses, they provide dinner, breakfast, and a bed on Mondays, Tuesdays, and Wednesdays when temperatures dip below freezing or above 100 degrees. Ten fortunate men won’t sleep in a shelter, makeshift camp, or on the streets during Friday nights this winter. They will find Room in the Inn at four Catholic parishes in Tarrant County. About 20 congregations in Fort Worth participate in the national program. 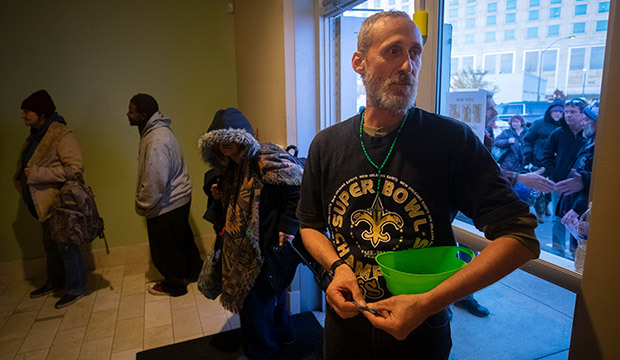 On those evenings, churches open their doors to volunteers and homeless guests. Together they sit down to a home-cooked meal, served on a real plate with silverware and table linens. Some guests may linger at the table to continue the conversation, while others may watch a movie or play a game with their hosts. 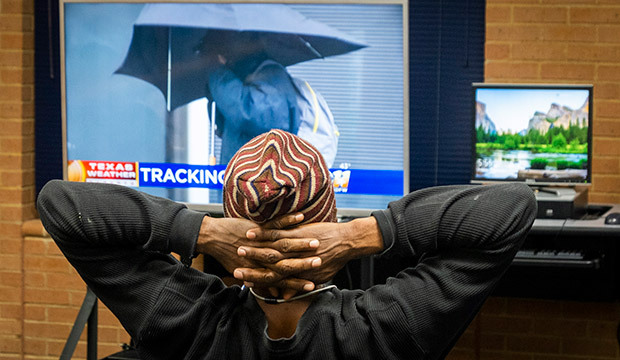 After a quiet night of slumber, the guests eat breakfast and are driven to DRC, a day shelter and homeless resource facility that selects and screens the homeless men who participate. St. John the Apostle Parish began hosting Room in the Inn by accident. 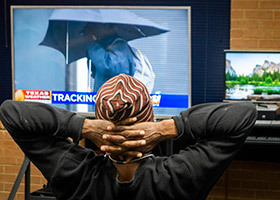 About nine years ago, a Methodist church next door asked them to cover a night when a last-minute conflict prevented them from hosting, explained Colleen Cargile, director of social ministries at the North Richland Hills parish. “The teachers [at St. John the Apostle Catholic School] stepped up to host and they loved it,” she said. Enthusiastic about the program, the parish overcame the logistical hurdles and became a host church six years ago. With their experience, they have coached other parishes interested in Room in the Inn. St. Peter the Apostle and Holy Family Parishes, with extra help from St. Andrew Parish, began welcoming guests last summer. At 2:00 p.m. on Dec. 7, a “whole army” of volunteers descended on St. Peter the Apostle School to transform classrooms into bedrooms and cook for the guests at the west Fort Worth parish, described Elvia Acevedo, one of three parish coordinators for Room in the Inn. The men who attended appreciated slow-cooked brisket and beans; a safe, clean, and spacious place to sleep; and interaction with people who are welcoming and interested in their lives. 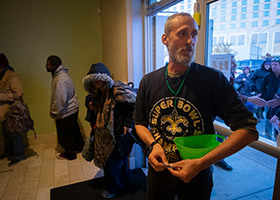 Bruce Frankel, the executive director of DRC, said the sincere fellowship between the men and the hosts can motivate the guests to redouble their efforts to obtain permanent housing. For the volunteers, the benefits may be even greater. Conversation breaks down the stigma of homelessness and the barriers between the two disparate worlds. When faith-based individuals understand homelessness, they become advocates and help address the problems, according to Frankel. The North Texas Catholic has been in publication since 1982. To view our archives please visit the link below.